Joining Elmbrook Rotary Club President Tom Curl and Vice President Mark Zalewski were their wives Lynda and Evonne respectively, along with team members Jan and Darcy Constable, Past Rotary District 6270 Governor Ted Gurzynski, current District Assistant Governor Sandy Bosin, and representing the Port Washington Rotary Club, Ruth Lansing, a veteran of two prior trips, and Bob Henckle. Local families in Antigua become engaged by agreeing to keep their children in school and through hard work and “sweat equity” by taking part in various projects. Unfortunately, the typical outcome for many of the children in the area is to become an “economic unit”, as families put them to work in the fields from the time they are five or six years old, with very few kids not getting more than a third grade education. This sad cycle repeats itself to where many of the children have the same kind of life their parents have had with little hope for a better life. Fortunately, with the support of Common Hope, a child has a very good chance of making it through sixth grade and beyond to high school. Since they’re beginning, over 1,000 kids have graduated from high school as a result of the Common Hope programs. The Elmbrook Rotary Club team, like more than 20 other teams that participate each year, spent a week building a simple home, working with kids in the classrooms of several of the Common Hope Partner Public Schools, distributing books, supplies, and sporting goods, much of it donated to the team from friends and local businesses and transported as excess luggage. They also provided welcome support for many social work visits, with team members being a required “witness”, allowing social work staff to make double the amount of calls they make during a typical week. In addition, and as part of a community effort in conjunction with the Antigua Rotary Club, filtration equipment was provided for many families who have no dependable supply of safe water. 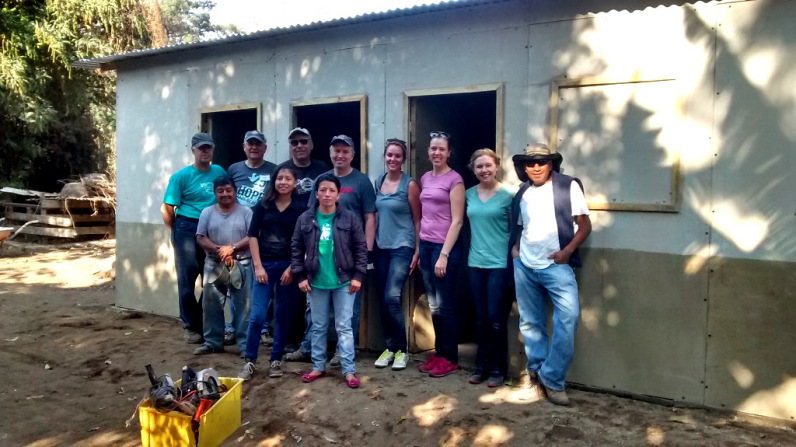 The house that was built by the team, is for a family who have earned it through many hours of working with Common Hope at their facilities, and in the schools that partner with Common Hope, in the kitchens and in the maintenance departments. The house is “panelized” at the central work yard and transported to the site which may be owned or leased by the family who will live in the house. There is a tile or poured floor and two rooms, a total of approximately 250 square feet, and some functions are already in place outside the walls, such as communal bathrooms and cooking facilities. For the people who don’t own the land, the houses are easily disassembled and moved to another site if the need arises, including the tiled flooring. Since 2011, Elmbrook Rotary Club has sent 5 Teams including the “Advance Team” that did the initial legwork for our efforts. Over 35 members including their friends and family members have traveled to Guatemala, with many making the trip more than once. Each person do so at their own expense which includes airfare and room and board while in Antigua. A small part of the trip also includes some sightseeing while enjoying the local culture of Antigua, a UNESCO World Heritage City boasting a long, interesting, and important history in Central America. A number of participants have extended their stay beyond the weeklong program, in order to see more of Guatemala’s amazing sights and attractions, including the Mayan ruins at Tikal, Lake Atitlan, and the giant Mayan market held in Chichicastenango. Another very important aspect of the Common Hope program is the opportunity for Elmbrook Rotary Club members and their friends to sponsor a specific student directly, with visits to the family home and written communication throughout the year. The sponsorship helps tie in a family affiliation throughout the year while making school attendance possible for the children who don’t have to spend every day contributing economically to the support of the family. This past November, Elmbrook Rotarian and Sergeant-at-Arms, Linda Edelstein traveled to Guatemala to help Esvin Hernandez, a young man who the Club has sponsored over the past several years, as he celebrated his graduation from high school with his family. Recenty, the club has taken on another student who will graduate in November of 2015, and the intent is to help students get through the last year or two where the risk of having to drop out of school is high. While this is a problem, it’s not issue with sponsored students and in all, Elmbrook Rotarians are helping 22 kids stay in school! For anyone who is interested in learning more about this program or any of Elmbrook Rotary Club’s International programs, including outreach efforts in India, Vietnam, and Ecuador, you are invited to contact Club President Tom Curl at tlcurl@wi.rr.com.